There's no way I don't get nominated this year. As prologue, let's step into the WayBack Machine and bump the dial back to early June, when I casually mentioned to Doc Karen that I had seen several feral cats on my evening dog walks. In addition to being an MD, Karen is also a NYS licensed wildlife rescuer so I should have known that I was shaking a hornets' nest. A week later, over my fourth or fifth margarita, I found that I had agreed to allow my shop to be used as a holding facility for the Great Owls Head Cat Roundup. Karen hooked me with the Mayor's Alliance and the ASPCA for a trap-neuter-release campaign (called a TNR -- I learned some new lingo hanging with these people). The TNR would encompass at least two known colonies and four caretakers (again, lingo) over a geographic area of about five blocks. I was surprised to learn that feral cats aren't usually loners but are part of a loose colony of ferals. A cat that isn't part of a colony is called a rogue. Do I need a glossary here? I can't say I didn't have misgivings about X number of wild cats in my pristine shop, especially when I know what a drop of water can do to my steel decked tools. In fact, I had a lot of reservations about it after I was told that X could be as high as 28, which is the maximum number of cats the ASPCA bus can spay/neuter in a day. I also learned that I would be expected to help with the feeding and cage cleanings twice a day. At even five minutes per cat, that's a lot of hours over the course of the five to seven days they would be guests of BrooklynRowHouse. I can't say that Meredith from Mayor's Alliance didn't give me multiple chances to back out. On Thursday night they started loading in the cages and I could see that it was going to be a larger operation than I'd anticipated. It wasn't just 26 cages but food, bowls, bed linens, plastic sheets and cage dressing for the occupants. And lots and lots of garbage bags. The old newspaper pile alone was three feet high. On Friday evening, a half dozen NYS-licensed wildlife rescuers and volunteer trappers assembled in the basement to discuss the night's trapping job. With them was an observer from a huge animal sanctuary in Utah called Best Friends Animal Society. Paul Berry was the CEO of Best Friends and was on a solo motorcycle trip around the country on his 2007 Harley Road King, checking out the local rescue organizations. Paul and Best Friends got national press by rescuing the 22 pit bulls from Michael Vick's dog fighting operation. Over the previous few evenings the trappers had scouted the locations, identified the colonies and planned where to drop the traps. 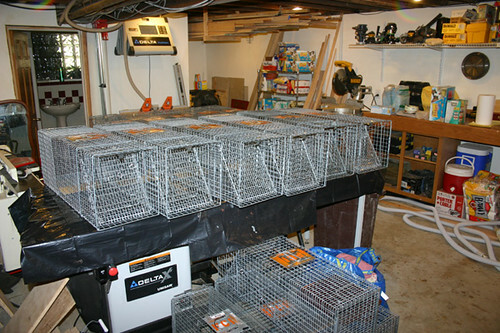 They also found and contacted local feeders and asked them not to put out food for the cats 24 hours prior to the trapping to make sure the cats were hungry. Each trap got a computer-printed sticky label identifying the location where it was to be dropped. Since the cats would remain in these traps for the next five to seven days, it also told the trappers where they were to be released. More information would be added to those labels as the week progressed: who wasn't eating, who had health issues, who needed additional testing, and so forth. Then it was time to deploy the traps. By the time they wrapped up around midnight, they had captured seventeen angry cats. I was astounded. It took me half a day to coax one of my cats into a carrier for a vet visit. The operation was repeated the next night. Meanwhile, caretakers showed up to help maintain the cats they had already trapped -- a job that needed to be done twice a day. The cats were kept covered with sheets to reduce their stress. One of the things that concerned me about offering up my basement for this job was cats howling all night, upsetting my sleep, my dogs and my neighbors. Karen assured me this wouldn't happen and she was right. The only meowing I heard was at feeding time. But what I wasn't prepared for was the smell. 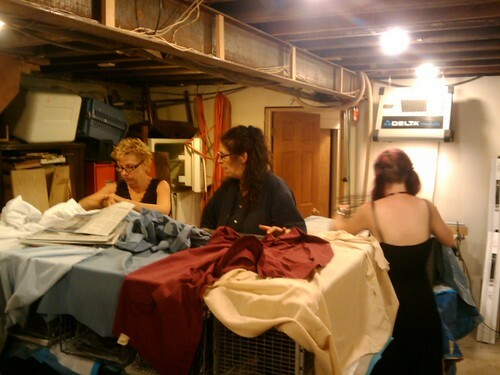 The odor of a basement full of gamey cats was intense but fortunately isolated to the basement. Since everything the cats could pee on was protected by heavy plastic sheets there shouldn't be a lingering odor. I was curious how they were going to feed and change the cage dressings for all these escape artists, which remained in their original trapping cages. They had a clever tool which looked something like a barbecue grill with one side missing. The tines slipped between the wires which not only bisected the cage but also let them coax a cat into moving to one side. With the cat secured at one end of the cage, they could open the access door on the other to change the newspapers, food and water. 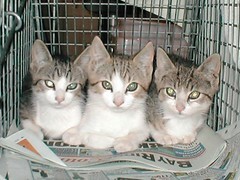 By Sunday evening, the net catch was 26 cats: 16 adults and 10 kittens, including these three heartbreakers. 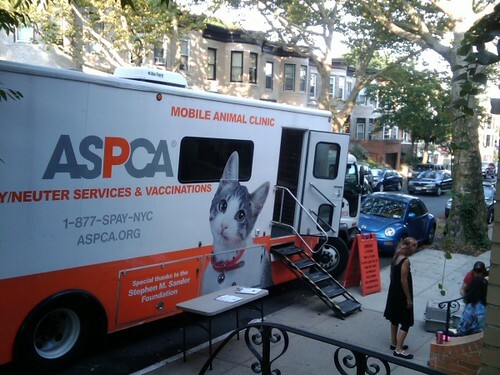 This was all preparation for the main act: the ASPCA mobile clinic. After a quick negotiation with my neighbors, we parked our cars to reserve space in front of my garage for the forty foot truck, which arrived bright and early Monday morning. The trappers transferred all the cages to the truck and the veterinarian went to work. By 3pm, all the cats old enough to be spayed or neutered were done. They were also given an exam, disease tests and vaccinations. Finally, every neutered cat had the tip of his or her left ear removed so that the next group of trappers would know to ignore it. Then the cats were moved back into my basement. On Wednesday night, the release phase began. The ten adult males were taken back to their trapping locations and released. Because the females' operation was more invasive they're given an extra 48 hours of recovery time before release. They go out tonight. That leaves the ten kittens. Trappers don't like releasing kittens because most are young enough to be "turned" into good house pets. I know this is true because my last five cats were kittens rescued from feral colonies. The 800 pound gorilla in the room today is, who's going to foster them until the next adoption event? Some of the trappers are already fostering up to 20+ cats. Later: I kept one stray from the roundup. 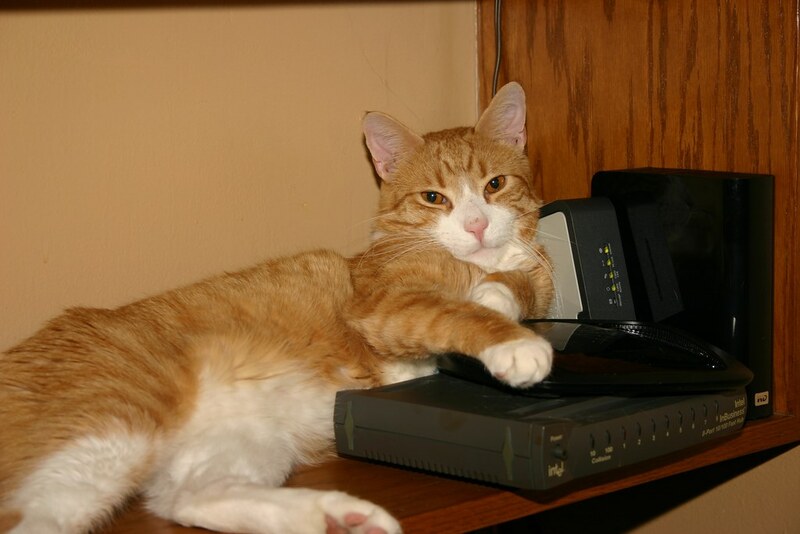 Meet Ralphie, making himself at home on my router. For more information, see NYCFeralCat.org. Well done. Good karma coming your way. Thanks for the detailed account...fascinating. Oy vey! That is A LOT of work. But so necessary! Good for you! We received a 'grey gardens' discount on our row house due to the....um.....cat situation next door. This post helped me know what to expect when I participate in a TNR here. Congratulations on a successful TNR operation! Thank you so much for assisting in this important campaign. Spaying and neutering is essential in controlling the animal population. Cheers to You! What an operation! My brother's fed a feral cat colony by him for years. They've spayed and neutered some of them but I don't think the process was quite to this level. And those kittens are adorable! I was happy to hear that you used a lot of plastic sheeting since I bought a cat hoarders house and am all too familiar with the ramifications of lots of cats / no precautions. Truly an admirable thing you've done there. I'm sure after encountering those 3 kittens pictured above, anyone would be moved to do the same as you. Well anyone with a shop big enough to handle this operation.